References m_DrawSymbolSample, m_pSamplePreviewWidget, and m_pSymbolPreviewWidget. References DELETEP, m_DrawSymbolSample, m_pSamplePreviewWidget, and m_pSymbolPreviewWidget. References _setFontFromCombo(), destroy(), doInsertSymbol(), XAP_Dialog_Insert_Symbol::m_answer, m_hDlg, and UT_DEBUGMSG. References XAP_Dialog_Insert_Symbol::_createSymbolareaFromGC(), XAP_Dialog_Insert_Symbol::_createSymbolFromGC(), XAP_Dialog_Insert_Symbol::_getCurrentSymbolMap(), _setFontFromCombo(), XAP_Win32DialogBase::centerDialog(), XAP_Dialog_Insert_Symbol::ConstructWindowName(), fontEnumProcedure(), XAP_Draw_Symbol::getGraphics(), XAP_Win32PreviewWidget::getGraphics(), XAP_Win32PreviewWidget::getWindowSize(), XAP_Win32DialogBase::localizeControlText(), XAP_Dialog_Insert_Symbol::m_DrawSymbol, m_DrawSymbolSample, m_hDlg, XAP_Dialog::m_pApp, m_pSamplePreviewWidget, XAP_Draw_Symbol_sample::m_pSymbolDraw, m_pSymbolPreviewWidget, XAP_Dialog_Insert_Symbol::m_WindowName, XAP_Win32DialogBase::setDialogTitle(), XAP_Win32PreviewWidget::setInsertSymbolParent(), XAP_Win32PreviewWidget::setPreview(), Symbol_font_selected, and UT_ASSERT. References XAP_Draw_Symbol::draw(), XAP_Draw_Symbol::drawarea(), m_CurrentSymbol, XAP_Dialog_Insert_Symbol::m_DrawSymbol, m_hDlg, m_PreviousSymbol, XAP_Draw_Symbol::setSelectedFont(), Symbol_font_selected, UT_ASSERT_HARMLESS, UT_SHOULD_NOT_HAPPEN, and UT_UCS4_strcpy_char(). References XAP_Dialog_Insert_Symbol::ConstructWindowName(), m_hDlg, XAP_Dialog_Insert_Symbol::m_WindowName, XAP_Win32DialogBase::setDialogTitle(), and UT_ASSERT. References XAP_Dialog_Insert_Symbol::_onInsertButton(), XAP_Draw_Symbol::getCurrent(), XAP_Dialog_Insert_Symbol::m_DrawSymbol, and XAP_Dialog_Insert_Symbol::m_Inserted_Symbol. Referenced by _onCommand(), and XAP_Win32PreviewWidget::_wndProc(). References XAP_Dialog_Insert_Symbol::ConstructWindowName(), XAP_Frame::getFrameImpl(), m_hDlg, XAP_Dialog_Insert_Symbol::m_WindowName, XAP_Win32DialogBase::setDialogTitle(), and UT_return_if_fail. References XAP_Frame::getFrameImpl(), m_hDlg, and UT_return_if_fail. 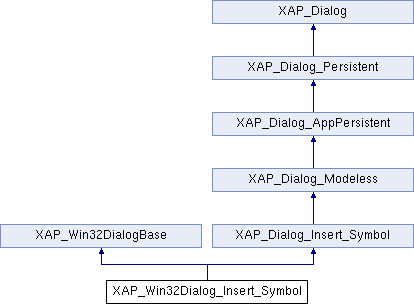 References XAP_Win32DialogBase::createModal(), XAP_Dialog::m_id, XAP_Win32DialogBase::setDialog(), UT_ASSERT, and XAP_DIALOG_ID_INSERT_SYMBOL. References XAP_Win32DialogBase::createModeless(), XAP_Dialog::m_id, XAP_Dialog::m_pApp, XAP_App::rememberModelessId(), XAP_Win32DialogBase::setDialog(), UT_ASSERT, and XAP_DIALOG_ID_INSERT_SYMBOL. Referenced by _onInitDialog(), XAP_Win32Dialog_Insert_Symbol(), and ~XAP_Win32Dialog_Insert_Symbol(). Referenced by _enumFont(), _onCommand(), _onInitDialog(), _setFontFromCombo(), activate(), destroy(), notifyActiveFrame(), and notifyCloseFrame().